Jewels (or gems or gemstones) are rare minerals. They usually have colours. They begin in a rough rock form but can be cut and polished to make jewellery. 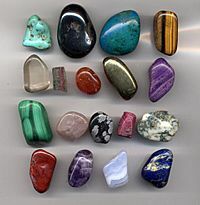 Some other non-mineral rocks (such as lapis lazuli) or organic materials can also be also used for jewelry and are called gemstones. These include amber or jet. Pearls and coral are sometimes also called gemstones. Most gemstones are hard. Soft minerals are used in jewelry too, because of their luster that gives them value. Being rare (in short supply) also makes a gemstone valuable. The Ancient Greeks began to decide which gems are precious and semi-precious. This continued in other cultures. In modern times, the precious stones are diamond, ruby, sapphire and emerald, with all other gemstones being semi-precious. Jewel Facts for Kids. Kiddle Encyclopedia.